Fronton is a unique wine region located on the left bank of the Tarn River about twenty miles north of Toulouse. Lying partially on a plateau, the area is generally flat, with occasional hills that contain gently sloped vineyards. The area's subsoil is composed of ice age limestone deposits. Some of the topsoil is made up of small limestone pieces called boulbenes mixed with sand while others are topped by rouget, a particular clay very rich in iron that helps lend a particular earthy flavor to the wines. The climate of the region is both Atlantic influenced (temperate weather from the east with a good amount of rain) and Mediterranean-influenced, where warm winds come up from the south and help keep things dry. Fronton is an appellation for red and rosé wines only. Many producers make white wines, but usually use the IGP Comte Tolosan or Vin de France denominations. Permitted grapes for Fronton includeNegrette, Cabernet Sauvignon, Cabernet Franc, Syrah, Gamay, Fer Servadou, Cinsault, and Mauzac Noir. The two major towns in the appellation are Villaudric and Fronton itself. During the religious wars, Villaudric was Protestant and Fronton Catholic. The first vines were planted in the region around 500 AD. In the 12th century, Vin de Negret was enjoyed by Pope Calixtus II. In the 17th Century, Louis XIII also became a fan of the wine. The wines from Villaudric are said to have more delicacy and finesse than those of Fronton, whose wines are often fuller bodied and with a higher alcohol degree. Both were given VDQS status in the mid-1940s. The Côtes du Frontonnais was promoted to AOC status in 1975, with Villaudric releasing its wines in Burgundy bottles and Fronton using Bordeaux-shaped bottles. 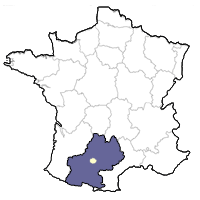 In 2005, the name of the appellation was changed to Fronton. The grape that sets Fronton apart from other regions is Negrette. Although unusual, this grape can found in minute quantities in neighboring Gaillac, the Charente, and the United States where it goes under the name Pinot St. George. Negrette is said to be a descendant of an ancient variety from Cyprus called Mavro whose vines were carried back to Gaillac by the Knights Templar during the Middle Ages. As the centuries passed, the grape descended to nearby Fronton where it stuck. Fronton vineyards must be planted with at least 50% Negrette. The variety gives high yields, so pruning and proper trellising are of utmost importance. The grape has thin skin, making it highly susceptible to powdery mildew and gray rot. Yet even with such little skin to color the juice, the wines always have deep robe. Fertilizers in the vineyard boost yields, but quality is nearly always severely compromised when yields are pushed so there is a move to use more natural composts nowadays. Negrette also has low acidity and tends to oxidize easily. Yet when vinified carefully and complimented with small proportions of other grapes (Cabernet Sauvignon and Syrah for color and tannin, Gamay and Cabernet Franc for aroma), it yields wonderfully fresh wines rich with flavors of blackberry, fresh cherry, licorice, spice and its hallmark violet note. When well done, the wines can aromatically resemble those made with Syrah from the Northern Rhône. ​Fronton wines provide a wonderful accompaniment to the rich foods of the region (pork sausages, cassoulet, veal stew) and are priced for everyday consumption.